It's Player Appreciation Week at the PDCC! That means we've got more sponsors and prizes for this weeks players! I love stopping by your blogs to see what you've been creating with the color stories, next week will be my last post as a PDCC Designer, I've truly enjoyed my time here with the other designers, and YOU. 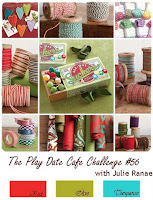 This weeks brings us a lovely color story from Julie Ranae (with Red, Olive and Turquoise as your colors); some new sponsors, Guest Designers and FAB prizes! This week the PDCC Featured Sponsor is EAD Designs; with P.A.W. Sponsors Discount Cardstock and Wilson Designs. We have Guest Designers from all three companies, their DT's are playing along added inspiration, and some fab prizes offered by all three companies! Once I had my Stickerz in place, I added some Silver Gems, then filled my Cello Bag, adding more Stickrez/Gems to decorate the bag. 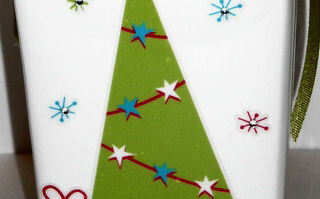 The Tag is also from this set, I just backed it on card stock and adhered it under the Snowflake Charm. Here's this weeks Color Story Photo. We'd love for you to play along with us at the Cafe, you can find all the details here on how to enter. If you upload to any online gallery please use keyword PDCC#56 so we can find your creations! Having seen this in person I can tell you it is even more beautiful IRL. Loved how you accented the snowflakes with the gems and created the mini tag! Who would have known that they are stickers! Amazing piece of altered art GF! Love how you've used the stickers, I wouldn't have thought to use them for anything other than a card! This looks great! Are you sure you didn't buy this at Hobby Lobby?? It looks store bought to me...! Love it! What a fabulous treat holder!! Great use of stickers! Have a great evening! Oh and you really started something with the "CC." How sweet!!! What a creative way to decorate the ceramic piece! What a great idea...lovin' it...so pretty!!! I love that you took these stickers and placed them on a ceramic piece! LOVE that you think outside the card box--I am too chicken! But this inspires me:) LOVELY job!! I can't believe next week is your last week--so sad! I really have enjoyed working with you and being on the same team! I LOVE the PDCC team! De belles couleurs, élégance et simplicité, c'est ce que j'aime. Wonderfully creative, Lisa! 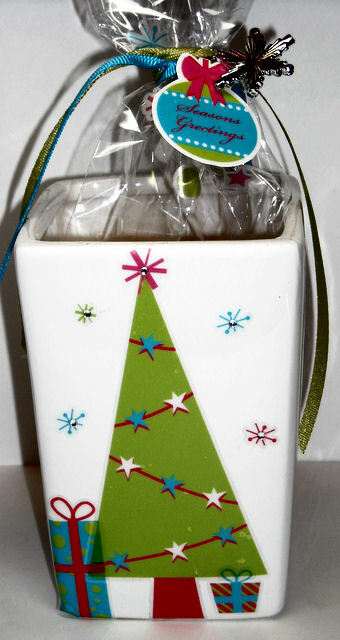 Love the project design, you've done a super job with this ceramic goody holder and those festive stickers! What a neat idea! I would love to get one of those jars. alterable cabinet....LOVE it!!!! Aren't the stickerz soooo fun...love how you altered the giftie!